Layout and capacity: Upstairs: 1 room with 3 single beds, 1 room with 4 single beds, and 9 single beds in a communal sleeping area. Capacity 16. The main winter route into the Jackal Hut follows FS 755 which climbs very steeply out of South Camp Hale. Although this route is only 4.7 miles it gains over 2500ft of elevation so be prepared for steep climb. Vail Pass Winter Recreation Area Fee This hut is located in the Vail Pass Winter Recreation Area. 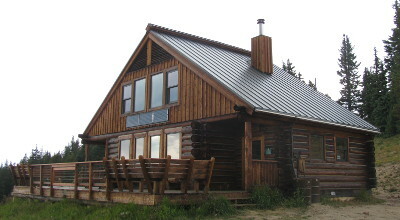 Use of this hut during most of the winter requires payment of additional fees to the U.S. Forest service that will be charged at the time you make your reservation. This is not a parking fee; it applies regardless of which trailhead is used. The $6.00 per person per night fee is in effect from Thanksgiving through the end of April, children 13 and under are free. More information. 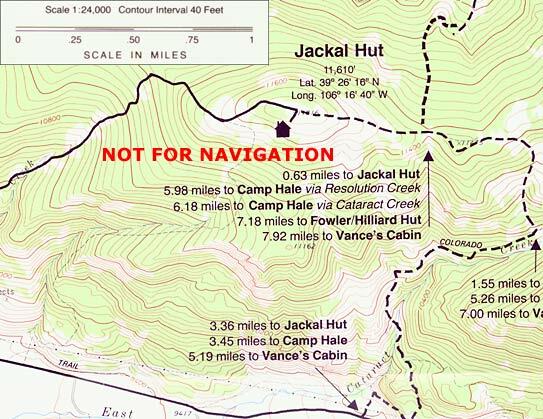 The main summer access to the Jackal Hut is by hiking, biking or driving up FS 755. Motorized vehicle must park at the summer closure gate approximately 1/4 mile from the hut. There is no established summer hiking trail to this hut. Be aware that this road is very steep and rough and not recommended for vehicle access. The other route in is driving up Pearl Creek Road to where it ends about 1.5 miles from the hut and hiking in on an abandoned jeep trail from there. Vehicle access is never guaranteed to any hut at any time.